Mobile technology in a store; every retailer is talking about it. However, is their execution adding value to the business? – Olivier Ropars, eBay INC. In order to leverage business value from in-store experiences, retailers are now creating user stories for customers that guide their brand interactions. Whether it’s scanning products through an app, using beacon technology in the checkout process, or hastening a customers purchase-decision cycle through an automated email, the game is changing. Many global retailers have rethought mobile technology’s place in elevating the consumer journey, in-store. Marketing Managers are having to keep digital strategies and campaigns at the forefront of their business, or there’s serious fear of falling behind. Previously, customers had to visit another store if their size, colour or style was unavailable, but mobile technology has now bridged that gap. While still in the store, shoppers can purchase online or save the product details for later. While some brands are executing these new trends well, others are falling behind and maintaining old business models. As the customer expectation is steadily increasing, retailers need to come to the party and innovate with technology, too. Thanks to elevated user journeys, shoppers can use the store as a multiple purchase pathway, not just the only destination. Through developments in scan technology, consumers can now store product information in the shop and purchase at a later time. Fashion giant Zara, who have 1808 stores globally, are renowned for their creative flair in both their ecommerce practices and in-store experiences. 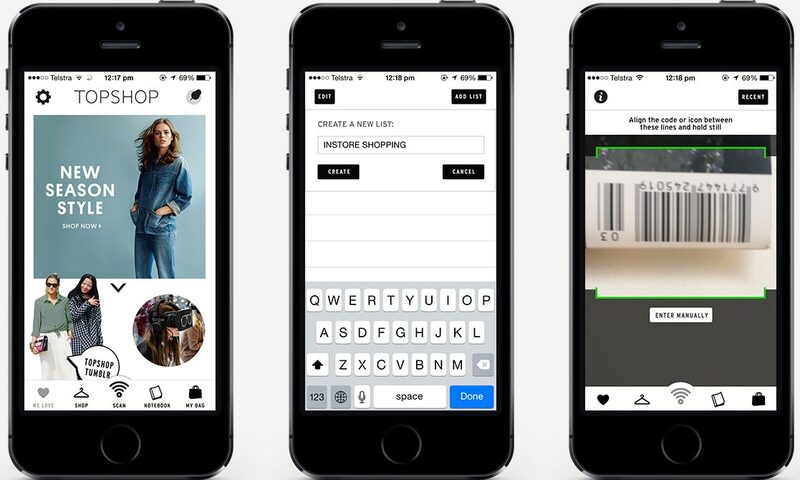 The Zara App features a barcode scanner that enables users to scan products in-store whilst shopping. If the product is unavailable in-store, the user can save all the details for a later purchase, or follow the link directly to the online store. An interesting strategic decision by Zara was to limit the app exclusively to Samsung mobile devices for the first month of release. This meant that data was gathered from one interface only, enabling the Zara team to optimise the app before integrating it into an entire marketplace of devices. Creating a similar experience in 37 countries around the world, Topshop’s app technology has been reviewed by The Mobile Shopper as, “portraying an exciting, high fashion and unique fashion brand”. The app features similar barcode-scanning technology, that enables a purchase to take place after shopping in a store. Another great feature is the Notebook section, where a customer can curate their favourite looks while in-store, and save them in the notebook to purchase later. Previously, staff members wrote down product codes on paper, most likely tossed in the bin. Now, the app allows their engagement with customers to extend long past the in-store experience. Branded touch-points are now supporting existing consumer behaviours in researching products before, during and after entering the store. The app, Goodreads, provides a best in class experience for book lovers who are looking for information about their products on the path to purchase. On entering any bookstore chain, the app provides shoppers with background details on the writer , all of their most current books and reviews. The app effectively arms customers with valuable product information, empowering them as active shoppers, and enabling them to get the most out of the purchase experience. The Home Depot augmented reality app enables shoppers to create an image of what their home would look like with Home Depot products. Customers can shape items to exactly the size of their house (see below) and then select their closest store to pick up the product. This creates a more secure purchase experience. For example, a customer can directly imagine what a new door will look like when replacing their old one. Whether it’s a music festival, flight overseas or visit to the local cinema, the experience scene is also now heavily entrenched in digital engagement. Though currently in its infancy, the iOS app, Passbook, holds the potential to revolutionise the experiential industry. 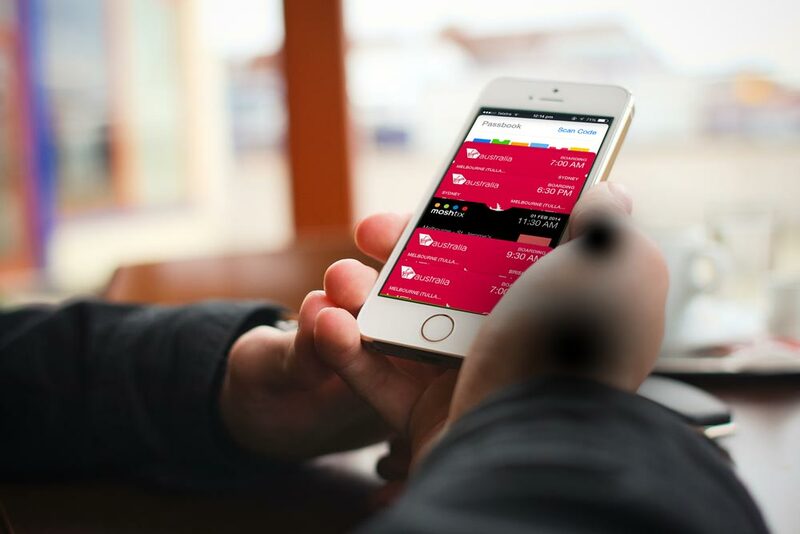 For example, on a local level, Virgin Australia has integrated with Passbook to enable travelers to access an e-ticket from their mobile device. They can then proceed straight through security and scan their mobile at the gate. This frictionless process is setting the bar for consumers’ expectations of the travel experience. Other events, like the Laneway Music Festival, have used Passbook to also store their guests’ tickets. That “Oh no, I’ve left my ticket at home!” moment will surely become a thing of the past in the coming years, with users more likely to have their mobile on them at all times, rather than a piece of paper. As ecommerce budgets rise, and the job listings for the ‘Head of Digital’ role increase, so to will the customers’ expectations of favourite brands. For example, the Home Depot product really engages with customers BOTH in the store and at home. A growing number of brands are paving the way in this space, supporting the old habits of their consumers whilst enhancing them through the use of mobile technology. While the store will always (at least for the foreseeable future) remain central to a brand’s story, consumers will equally expect mobile technology to match and enhance that experience.